Obviously an adoption story. But sweet nonetheless. And I liked that the ending is natural - no HEA that Goose gets to connect with her birth parents. The paintings, well, they're artistic... I could see that some other reviewers didn't care for them, but I did.Most of all I appreciated the small size, the unassuming format. It's not all in-your-face saying, "Buy me! I'm an oversize, overpriced, instant classic!" I really enjoyed this book because of the way the author/illustrator was able to convey the goos's feelings of sadness enjoy within such a short book. Within a short amount of time, we as readers feel sorry for the goose because it can't fly, yet we immediately feel great joy when the goose learned to fly and returns home to her friends and family. I also really enjoyed the illustrations of the book. The illustrator decided to use different strategies such as various rectangle and square types of images in order to make the illustrations stand out. The illustrations also appeared very realistic which made the story all the more engaging. Purpose/use in the classroom: I think the best use for this book would be in a read aloud setting for young pre-K to Kindergarden students because of it's short length and readability. It will not bore the students because the pacing of the story is very quick. Furthermore, I think this book would be a good tool to use to model "actions" or "verbs" for the students. There are plenty of verbs that have to do with flying and landing and other verbs that have to do with communication such as laughing, talking, crying, etc. Since they are beginning to read, this type of vocabulary is good for their exposure and introduction to literature. Also, students will be able to learn good morals from the story such as believing in yourself, and accepting that you may be different and unique but you are a special person and it is a GOOD thing. This will be good for young children to here as they may be feeling the pressures of being exposed into social situations for the first time. My first impression of this book was that it was so cute and taught such a sweet lesson about being different from just a few pages and such a small amount of words. This goose was born into a family of woodchucks and her friends consisted of rabbits and other animals. She felt really different because she was the only duck so she decided to leave. She got really lonely until she fell off a cliff and found out that she could fly. This teaches children that even though you feel different from everyone else, you have this special power that can stand out from everyone else. You can even impress yourself by having the courage and bravery to find yourself and who you are. A good lesson for the class would be to talk about how some children may feel different or left out and the children can express a time when they felt different and left out from a crowd too. A great book that teaches diversity in the classroom too. The words are very few, some words repeat, and the sentences are very short. There is about one sentence per page of the book. The pictures take up most of the pages and do a very good job at communicating the story. This would be considered a beginners book and a child at a very young age who is just starting to read would highly enjoy reading this book either independently or read aloud to them. Overall, I highly recommend this book and the lesson that it teaches can relate to anybody. My biggest problem with the illustrations of this book was that about half of the pages were broken apart with borders to create either a set of rectangles or smaller squares on the pages. Though this was used to set apart differnt sections of the story, the inconsistency really made it hard to follow and took away from the flow of the story. There was just too many different elements going on within the different pages that the book did not feel like a collective whole. I think the author/illustrator's intent was to create a more abstract look with this constant switching of settings, but it did not work for me. I really liked a few things about this book. I liked how all the pictures were very realistic, expect the one where the woodchucks make a pyramid to cheer up the goose. The way that one picture stood out made it extra cute and funny. I also really loved how Molly Bang could use just a few pictures and short text to make us feel the goose's sadness and then joy upon feeling different and then returning home once she discovered herself. Many stories do this in a shallow way, but this really gets at the heart of it. An amazing bit of visual storytelling with an unexpected, heart-warming ending. Molly Bang's sense of composition at it's finest - every piece immerses the reader in this modern ugly duckling tale. Lavish colors and adorable wildlife make this a perfect tale for growing up. Not the greatest of pictures but I liked the story. A goose is born into a woodchuck family....but when the Goose accidentally falls of a cliff..he flaps his wings and flaps his wings...and he learns he can fly.! !A twist on the ugly duckling story! NC790L. Kind of a scary adoptive book. 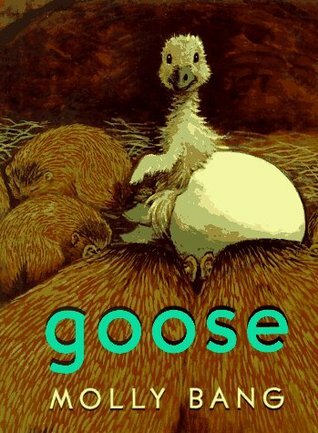 A young reader stated that it was sad, that Goose doesn't get back to her birth mother. Her adopted family was loving and accepting. Lovely illustrations. We thought this was ultra cute. It's like "The Ugly Ducking," only the goose is welcomed into his new family. Even though he needed to go away for a bit, there is a nice happy ending. Some really fun pictures. Cute, short and great pictures. Cute little bookAdopted by woodchucks at birth, a baby goose never feels she truly belongs--until the day she discovers she can fly. Wonderful little story about being different - would go so nicely with Andersen's Ugly Duckling - and Bang is such a fine illustrator too! READS Streaming Video Weston Woods Read by Laura Dern. Hard to really judge this fairly, as the copy we checked out from the library is missing one or two pages. What is there seems interesting for B.